Fiberglass Shelters vs Aluminum Shelters - What's the Life Cycle Cost? You’ve got sa piece of equipment that needs a cover. Maybe it's some type of pumping system, control valve, or an air compressor. As you’ve searched the internet, the options found may include aluminum shelters and fiberglass shelters. As you are considering the advantages and disadvantages of both, there are a few key operational and life cycle cost differences to consider. Read on as we cover these three important factors – longevity, repair, and replacement. Both aluminum shelters and fiberglass enclosures are virtually maintenance free solutions. Both enclosures are made of interior and exterior materials built to last with few if any parts which need routine maintenance or could fail. They are both designed and manufactured to be maintenance free. Many aluminum shelter manufacturers choose to use marine grade aluminum so the enclosure can withstand most weather conditions and environments. It can degrade, however, when certain gases are present such as chlorine. On the other hand, fiberglass shelters are susceptible to UV rays. Exposure to the sun causes what's called "fiber bloom" and may cause holes in the material. How long will the fiberglass last in the sun when compared to the unlimited lifetime of the aluminum? To combat this, some manufacturers add a gel coat to their enclosures. Typically, the coating is added not only to protect the shelter from UV rays, but also to smooth out imperfections in the fiberglass and give it a glossy appearance. A gel coat also helps protect the shelter from water damage, scratches, and dents, but may need to be repaired periodically. The possibility of damage to a shelter may seem remote. However, as we all know things happen. Trees and large branches fall, strong winds carry debris through the air, and vehicles can cause significant damage to the equipment shelter. 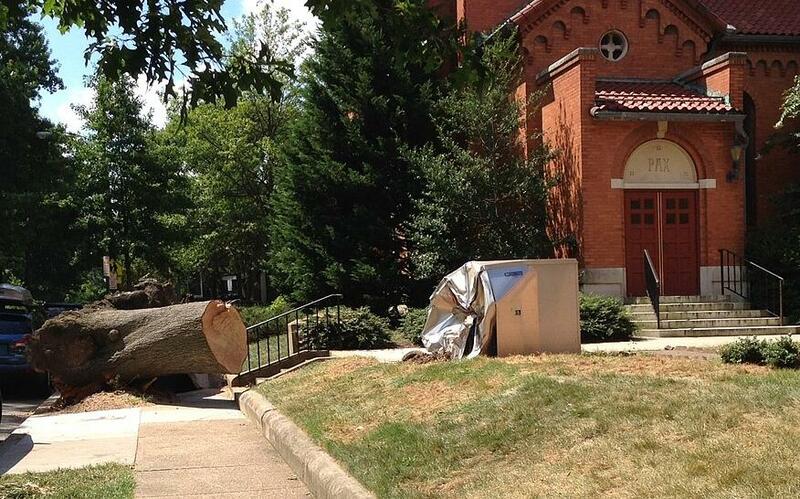 Take a look at this shelter damaged by a large tree falling on it. Maybe the damage is not as dramatic as this example, but when it occurs, how does the repair compare between the aluminum and the fiberglass? Most aluminum enclosures, but not all, offer a panel design which allows a single panel or selected panels to be replaced. At Safe-T-Cover, our standard line of enclosures are manufactured using a few panel sizes, meaning we typically have each type in stock ready to be shipped. This is a quick and inexpensive repair that can done at any time during the year which means your equipment is fully protected again in a short period of time. If the aluminum shelter is a popular standard model, the manufacturer might be able to ship a complete enclosure the next day if needed. What about the fiberglass repair? 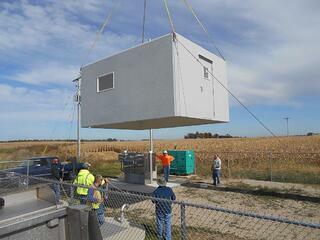 Some fiberglass shelters are shipped assembled and put in place with a crane. This indicates the repair may not be as fast and could be more costly as it's likely the entire shelter would need to be replaced even if only part of it is damaged. A field repair may be the quickest solution to the problem, however most fiberglass repair must be done when temperatures are at least 65 degrees and moisture will cause the repair to fail. In the right conditions, you can repair fiberglass with a patch, acetone, sandpaper, and a dremel. Then you'll need to use resin, hardener, and apply new gel coat as well. Here are fiberglass repair instructions from a fiberglass shelter manufacturer. Inevitably, equipment fails and needs to be replaced. When it does, there are differences between aluminum equipment shelters and fiberglass equipment shelters to consider. Some, but not all, aluminum manufacturers offer a design where the roof panels can be easily removed. It is as simple as backing out the hardware, removing the roof panel(s), then lifting out the equipment. Once the new equipment is place, simply put the roof panel back in place. If the aluminum shelter manufacturer does not offer this design, the entire enclosure may need to disassembled in order to replace the equipment. While not overly costly, this will add time and cost to the replacement project. We’re not aware of a fiberglass shelter that offers a removable roof design. Perhaps this design exists and we just haven't come across it yet. If the roof can’t be removed, then access panels will need to be located in the correct locations and be large enough to get equipment in and out or the entire shelter will need to be lifted. Plant maintenance staff (maybe that’s you!) will be glad you thought about this detail when the equipment is replaced. You need to cover your expensive equipment. Much time and thought probably went into that equipment purchase. Aluminum shelters and fiberglass shelters are both good solutions but each have pros and cons. Remember to consider the long term operational and life cycle cost differences reviewed here to help you make the decision that best fits your situation.